An interesting new work on the Chittim, best known to us as the people who sold Maaras Hamachpela to Avrohom. 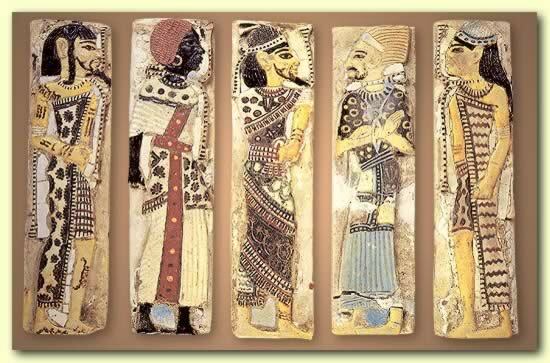 They were a people with an Indo-European language and customs, who also shared many Middle Eastern cultural norms. Being Indo-European, why are they classified as one the seven canaanite nations Perhaps, the refugees escaping the wreck of the mightly HIttile Empirey mixed with the native cannaanite population in the Land of Canaan and this is why they were considered to be one of seven nations. Pelishtim, on the other hand, retained their culture and ethnicity in entirety and are not considered as one of the seven nations. Comment: There are of course, many differing resconstructions and identifications of the nations in Geneis 11. However, this is one of the better maps and so I share it with you. Click to enlarge. One thing I never understood is why Hittites had an Indo-European language and culture if they were descendents of Ham. Anyone has an explanation? "Rabban Gamliel said, make for yourself a rabbi, remove yourself from doubt, and do not frequently give tithes by estimation." This is quite a difficult mishna and the difficulty is in its last statement. First, it is pretty clear that Rabbon Gamliel is driving at encouraging exactness. He says that one should have a Rav, presummably to teach and to answer questions and that one should avoid doing things out of doubt. The third statement appears to go in the same direction. We can see that it advises us not to give tithes (maasros) by estimation and that we should be exact when we give tithes. The difficulty with it is technical. It appears to imply that what is wrong with estimating tithes is that one whould not do so frequently or that it is not a laudable type of behavior. In fact, however, tithes are not valid to any degree, small or large, if given by estimation. Maasser must be given as one out of a hundred. If one gives less, not all of the chullin is "fixed". If one gives more, the maaser contains chullin, instead of all being maaser. The mishna may be making a larger point but it appears to be wrong on a basic fact of halacha, which is expressed in the mishna 6 of the fourth chapter of Terumos. According to most commentators it is speaking of maaser and terumas maaser. These have to be measured exactly, one part out of a ten. Even if we explain the mishna to refer to teruma instead of maaser, the general principle that maaser cannot be given by estimation is well established and is so codified by Rambam. What happens if one takes maaser by estimation is that either the masser which is taken or what remains consist of a mixture of maaser and chullin and this creates significant halachic problems. (See Bartenura here in Avos). Instead, what should be done is that a basket is measured so that exact tenths can be separated. In three periods of they year a basket is measured: When the first fruits come in, when the last are harvested and in the middle of the gathering process (Terumos 4:6). So what does one do with a halachically inaccurate mishna? Maharal in his commentary suggets that this mishna expresses the view of Abba Elazar ben Gomel in Eiruvin 50a, who holds that maaser can be taken by estimation in the same way that teruma is taken by estimation (this is the case biblically, rabinnically teruma also has a minimal shiur of 1/50, 1/40/ or 1/60). If this is so, we have a stam mishna agains halacha and also against another stam mishna in Terumos 4:5, which says, "He who counts (out the exact amount of maaser) is prasieworthy and who he mesures is more praiseworthy than he, and he who weighs is (even) more praiseworthy than he. Ein Lavanon attempts to prove that one is not allowed to ad initio take more than a tenth or less than a tenth. However, if he estimates a tenth, even if he miscalculates, the result is not considered a mixture of maaser and chullin. This is a novel approach and not shared by others. Jewish ingenuity being what it is, one can always find an exception to the rule of maaser needing to be taken exactly as one tenth. If one can find such an axception, he can then explain this mishna as referring to such an exception. Tiferes Yisroel objects to any attempt to see this mishna passage in purely technical terms of the laws of maaser becasue Avos is not a place in which maaser should be discussed. I'd add that it is also not a place in which exceptional and unusual halachic cases are displayed. Instead it is a tractate that teaches good character and moral living. It is not a showcase for presenting halchic curiosities. It is certainly not an opportunity to display halachic vitruosity. Tiferes Yisroel is certainly correct on this. However, there may be a place for a particular type of exception even in a tractate devoted to middos. If you find a maaser law that is very common, a part of daily life and that everyone encounters, it can serve as an example of a midda or behavior. This is the kind of an example that I propose to explain this mishna. Imagine that you have a whole storehouse of grain that you just harvested. Common situation, no? A Levite or a poor person come to visit you. This presents a difficulty, for you have nothing to give them except what's in the storehouse, but you cannot give them from the storehouse there because it has not been tithed. Of course, you can take out some grain and tithe it and give the maaaser to the Levite/poor man and keep the chullin for ourself. You will then have to find a place to store this chullin that already has been fixed but you can't jsut throw it into in the storehouse, where the produce that is still subject to maaser is being stored. Or, you can give them their maaser portion, and leave the now fixed chullin in the storehouse together with the reminder of the grain that has not been fixed yet. You can take the chullin out of the storehouse later, when you have the time and manpower, or perhaps wait until you proces and tithe the entire storehouse. In this situation, there may be a way in which you can estmate and need not measure exactly. One who had his produce in storage and gave a seah to a Levite and seah to a poor man, he can take out (from the storehouse) eight seahs and eat them - this is what R. Meir says. The Sages say: " he separates according to a measure (cheshbon)". What is this "measure"? There are many explanations. One of the more common ones is that R. Meir says that one does not need to be concerned that the maaser may have been consumed and that chullin cannot be any longer taken off on the basis of what was given to the Levite/ poor man. In other words, the owner can assume that the maaser that was given is still in existence and can take out chullin from storage according to the amount of maaser that was initially separated. The Sages say that one cannot rely on the maaser still being in existence. Instead one must ascertain what remains and take out only as much chullin as is justified by the amount of maaser still in existence. How does one ascertain this. Some commentators say that this must be known vaddai; however, it may be suggested that the owner can estimate. Without making this post more complicated, an understanding of cheshbon as arising from estimation comes out of how this term is used in two instances in chapter 5 of Terumos. We return now to our mishnah in Avos. "do not frequently give tithes by estimation". This is a common example from daily life. This means that one should not get used to giving maaser and leaving its corresponding chullin in the storage house, relying on estimating how much of the maaser is still in existance, when taking the chullin out. The pointt is the same as that on the other two examples in the mishna, that a person should not get used to traveling through life "by the seat of his pants", that one should not become accustomes to estimating and imprecision as a way of life, and that one should pursue exactness and clarity in everything one does. 2. Of all the clean animals you shall take for yourself seven pairs, a male and its mate, and of the animals that are not clean, two, a male and its mate. the main answer that extra kosher animals are needed to bring korbanos after the Mabul. This would then be sheep, goats, bulls, turtle doves,i.e., the animals used for sacrifices after Matan Torah by Jews. The only reason then for bringing seven rather than two, the minimal number required to repopulate the world, is to bring the remaining six for a thanksgiving sacrifice. Assuming Rahi's answer, the questiosn arises: Why six pairs for sacrifices?There are complex discussions of this question in various mefarshim (Shach al HaTorah, Panim Yafos, Chasam Sofer and Moshe Wolfson in Emunas Itecha p.12 etc). This depends on just who brought what type of korban and how many. Chasam Sofer, for example, stated that all six extra pairs were sacrificed for all three couples (not Cham and his wife as they sinned). There is also the question of whether an olah or/and a shlamim was brought and this is also complicated by certain offerings having to be only from male animals as opposed to others where females are required. In contrast, for example, the Klin Yakar as amplified by CHIDA in Pnai David and Radak (seen in Artscroll) state that seven pairs of kosher animals were not just used for sacrifices but extras were also needed for eating kosher meat which would occur post-Mabul. The difference between the two answers would be that not only the animals that can be sacrificed were taken iino the Ark in sevens; so also would be animals that are kosher to eat but not to sacrifice, such as deer, giraffes, chickens and also kosher locusts! illustrators. Here there only two giraffes. Compare the number of giraffes in each picture. The Maor VShemesh explains that the number of pure/kosher animals was greater due to their higher spiritual source/shoresh (as in Maaseh Merkava). Rabbi Wolfson also elaborates on this particularly concerning the lion (which we will address at a later time). The expectation of the coming of the Messiah, by which and because of which Judaism lives, would be a meaningless theologumenon, a mere idea in the philosophical sense, empty babble, if the appearance again and again of a 'false" Messiah did not render it reality and unreality, illusion and disillusion. The false Messiah is as old as hope for the true Messiah. He is the changing form of the changeless hope. He separates every Jewish generation into those whose faith is strong enough to give themselves up to an illusion, and those who hope is strong enough so that they do not allow themselves to be deluded. The former are beter, the latter stronger. The former bleed on the altar of eternity of the people, the latter are the priests who peform the service at the altar. And this goes on until the day when all is reversed, when the belief of the unbeliever will become truth and the hope of the hoping a lie. Then - and no one known whether this day may not be this very day - the task of hoping will come to an end and, when the morning of that day comes, everyone who still belongs among those who hope and not among those who believe will run the risk of being rejected. The danger hovers the apparently less endangered life of the hopeful. Uncle Moishe popularized a Jewish children's song, "Hashem is here, Hashem is there, Hashem is truly everywhere... Up up down down right left and all around is where He can be found." The concept is not just a children’s song but a mindset that permeates mitzvah performance in many cases. Many mitzvos are fulfilled by moving the chevtza, the object of the mitzva, in the six directions around the person as projected from the vantage point of the person standing in the center of cube and moving outward toward its facets. The most well-known such ceremony is the shaking a lulav with an esrog on Sukkos as discussed in Masechta Sukkah 37b. The two main reasons given in the gemara for the waving in all directions are to demonstrate the belief that the entire world belongs to HaShem and to ward off harmful winds and damaging dews. The commentary Aruch L'ner says the former reason is why we shake the Lulav in Hallel by "Hodu L'HaShem ki tov", to show that all good comes from HaShem; the latter reason is why we shake at "Ana HaShem hoshea na", to request that He should save us from the bad. The actual motions are to bring out and back (מוליך ומביא) the lulav set three times in each of the six directions. These motions (נענעוים)are expounded upon in chassidus as the expressions of ratzo v'shov, ( רצוא ושוב), literally translated as running and returning to and from HaShem. Ratso is drawing toward Divinity; Shov is return of the soul to the body in the world. The latter is also explained as a drawing down (המשכה) into the world the recognition that everything is from HaShem . The Meor Einayim and the Munkatcher Rebbe/Bnei Yissascha and Aruch L’Ner all enunciate the same Chassidic idea: Ratso, the running to Hsasem is to to thank him for all the good(chesed); Shov, the return to the world is sweeten the strictness/gevurah and to internalize the energy of the Ratso so it can be used. The Menachem Tziyon says that with naanuim we express our confidence that HaShem is present in this cube, the space in which we stand and shake the lulav, where an Accuser might arise... but we show that HaShem is there. This year when the first day of Sukkos falls out on Shabbas, we have no need to shake the lulav because Shabbas accomplishes all these things in and of itself, just as it does the avodah of the Shofar according to Chassidus. The back and forth and sideways motions are also seen in ceremonies associated with the other two of the shalosh regalim. The Omer was waved in this fashion on Pesach at the the time of the Temple. The Imrei Emes says these Omer motions assist in removing bad thoughts from man's mind. So too the shtei lechem were taken together with lambs in an ceremonial act called tenufah, the waving, on Shavuous; similarly bikkurim which are brought starting from Shavuous also undergo the process of “waving”. Even though we no longer physically perform these mitzvos in these times of exile, it is still recommended to study about them during these times for they are still spiritually relevant. Nite Gavriel Hilchos Chag HaSukkos p.431 brings many sources that Chassidishe Rebbes move the Sefer Torah in the same manner as naanuim during their hakafos on Simchas Torah. The terminology of "Ratzo V'Shov" comes from prophet Yechezkel's vision of the Divine Chariot, Merkava, recounted in the first chapter of his book. This is the chapter that is read for haftorah on Shavuos. The Avodas HaLevi (Staroselye) explains in a Shavuous drush how the back and forth mitzvos help a person become a chariot/merkava to his life source's energy from HaShem. Offerings diverse as the Todah, the thanksgiving offering, and that of the Sotah are also "shaked" in such a manner. The torches that were used as signals from mountain tops on Rosh Chodesh were also waved in the manner. The Levites themselves were lifted by Moshe in these motions by their inauguration. Rav Yosef Engel in Otzros Yosef groups them all together and points20out all that we just explained his drush according to the above theme. The Imrei Emes says the lifting of the Leviim was to purify after the Chet HaEgel. The Tzemach Tzedek sees the ceremony the lifting of the Leviim as bringing them back to their source (center of the cube).The nazir also waves his offerings at the end of his service in the same manner and one can easily extend these ideas to other instances. There is another, even deeper way to explain the naanuim. Siddur Arizal, the correspondence between recognizing Hashem in terms of His four-lettered name that is above space and time is expounded upon mathematically. The three different letters of that name YUD HEY and VAV (י & ה & ו) can be permutated into six arrangements (צירופים): YHV, YVH, VHY, VYH, HVY, HYV ( יהו יוה והי והי הוי היו ) Each arrangement represents one of the six sides of the cube. Although full delineation of this concept is quite elaborate: the general point is that these ceremonies cause us to recognize that through mitzvos, we can connect to a transcendental level of G-dliness. The explanation of the Arizal is based on Tikunei Zohar 29b where this relationship is introduced. Tikkunei Zohar is an exposition in part of the word Bereshis (בראשית) which when split in half can mean in Aramaic "creates six" (directions) (ברא שית). The underlying idea is that we acknowledge that the level of HaShem beyond the space-time continuum is responsible both for the good and seemingly bad in the world through the correlation of various arrangements of the Divine name with the directions in space. On Shabbas, we are at a level that is more elevated; on weekdays, including Yamim Tovim, we need to raise up to this level of acknowledgment by performing these motions. One way to pursue this concept is daily during davening, this is indeed can be accomplished by a person by focusing, meditating and directing one's motions according to this scheme. This is because, as in the case of Leviim, a person himself can be the chevtsa that he waves. While saying the first passuk of Shema, according to Masechtas Brachos 13b, a person accepts the kingship of HaShem "above and below, and to the four winds of heaven". Most recent commentaries bring that this intention should only be in thought, without discernible actual motion. Rabbi Betzalel Naor of Orot recently wrote an essay where he proposes that during the times of the Ge’onim and early Rishonim, there were actual physical head movements during Shema and brings the minhag from the Tur Shulchan Aruch 61 which quotes such a minhag from the Rosh. One can see an allusion to this in Mishnah Berurah (#22 to Shulchan Aruch 61) that one must be careful that this acceptance does not occur in a manner that would mark out the shape of a cross. Rav Ginsburgh of Gal Einai in an essay entitled "Shema Directions: The Six Idioms of the Shema" relates the six permutations of the three lettered root Shema in the same theme as discussed above for the meditation of the Arizal for lulav. The lulav is shaken three times in each of the three directions. There are not very many people who conduct themselves in this manner today during the Shema but it appears that there is no prohibition to do so. The intent would be the same as when one shakes a lulav - recognizing HaShem's sovereignty in all directions in one's own life. Artscroll Menachos (p.123) also proposes a connection between moving one's head during Shema and the waving lulav and omer. After reciting Kriyas Shema, a person procedes to the the Amidah, the high point and the culmination of davening. Zohar Pinchas Raya Mehemna 229a in the Matuk Dvash edition explains that the motions of a person during the amidah are identical to that of shaking a lulav. A person bows several times (up and down) and at the beginning of davening and during the amidah he moves back and forth. When finishing the Amidah and saying "Oseh Shalom" a person moves his head to the right and left, thus completing acknowledgment of Hashem in all six directions. Zohar then relates the significance of three times in six directions for the lulav to the 18 parts of the spine, which is one of the sources for the 18 blessings of the Amida. One can wonder if Uncle Moishe is aware that the "stretching exercises" he requests children to do in his shows are based on an ancient custom explained by Kabbalah! The idea that many mitzvos portray the longing to transcend the physical boundaries of this wordly existence and the inevitable drawing back into its boundaries, hopefully with a new awareness and sense of the Divine, is inherent in the very concept of Creation. R. Hirsch in the very beginning of his commentary to Bareishis explains that Torah presents a G-d who transcends Nature. Unlike pagan dieties that existed within the world and were bound by its physical laws, G-d the Creator is outside time and space - in fact, He created time and space. This idea leads to several corollaries. First, G-d is one. Pagan dieties, on the other hand, must be many, for each one enjoys a dominion over one or several natural forces, and since there are many such forces, there must be many gods. Secondly, Torah makes morality possible for it teaches that G-d is not bound by the limitation of matter, and as beings created in His image, neither are we. Consequently, we have the freedom to rise above matter, which pagans do not accept. Thirdly, it locates the Good above the world. To a pagan, gods can at most organize the pre-existing matter. Since evil stems from matter, to them it is inviolate and a part of the very fabric of the world. Not so to us. The all-good G-d created matter and He endowed it with a measure of goodness - this is truly the best of all possible worlds according to the purpose of the Creator. To a pagan, there is no rising above the primacy of matter; to a Jew we can rise, and even if we have to draw back, we are not essentially and inescapably given over to matter's dominion. True, religious life is a struggle, but it is a struggle to reach outside our six dimensions and to bring the glimpse of the Divine back with us and into our daily lives. This is ultimately the acting out and the meaning of naanuim, in lulav and in other mitzva performances. Is the Palestininan tenacity in their attachment to the Land of Israel based on their love for Eretz Israel that is present in every Jewish heart? The story was also covered by Mishpacha Cover: FORCED TO BE MUSLIMS Aharon Granevitch-Granot Issue 270 August 5, 2009 • 15 Av 5769.